Are there really only four personality types? The business of predicting how, from their personality profile, humans will behave has both fascinated and annoyed managers. Some disparage the science while others can’t do without it when hiring and developing staff. The problem is that it’s complex. It takes significant training and study to administer and analyse the results of a traits-based personality assessment such as the 15FQ+ tool used by TimelessTime. 15FQ+ uses the well-established ‘Big Five’ approach (described in the Annex below). Many managers think, “If only I could box traits into a small number of types, I could understand people and make easier decisions about them”. The problem lies is the diversity of human personality. As Murray and Kluckhohn said back in 1953, “Every man is in certain respects like all men, like some men, (and) like no other man”. Over the past 20 years there have been a host of pseudo-scientific attempts to simplify personality assessment. The DiSC tool is an example, pigeon-holing people into 12 types. Other more quackish claims have it that personality can be determined by the object shape that each prefers. Clearly the scope for error in such simplification is huge. This month, Northwestern University (USA) published the results of its research into personality types. The report suggests that its researchers have identified four personality types after analysing data from around 145,000 respondents. The data was gathered from published data-sets based on questionnaires completed online and analysed using ‘big-data’ computer analysis methods. Using cluster-seeking algorithms, they determined that people fell into four clusters which they suggest represent the four most prevalent personality types. Each cluster is defined by broad scores on the scales of each of the Big Five personality traits. The Big Five are considered to be the five basic personality traits that everyone has, to varying levels. The Big Five is also referred to as OCEAN, CANOE and FFM (five-factor model) and we give the definition of each of the factors later. Typically, each of the five traits is scored along a 10-level scale with opposing definitions of each traits at either end. Various combinations of scores are analysed to yield the predicted behaviour. The Northwestern researchers acknowledge that empirical studies across many languages and cultures over the past 50 years have shown the Big Five to be good predictors of behaviour, job performance and well-being. The Northwestern research just tries to meet the demand for simplification. Their algorithms identified four types of personality which they called Average, Role-model, Reserved and Self-centred. We summarise these further from the Northwestern paper in the Annex below. Simplicity taken to the bizarre? Their research shoe-horns OCEAN into 4 clusters. 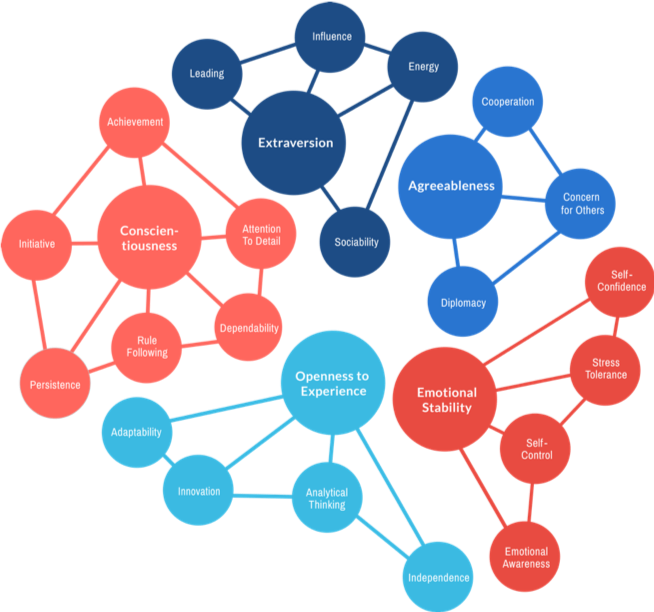 If each of the Big Five attributes (Openness, Conscientiousness, Extroversion, Agreeableness and Neuroticism) has just five levels instead of 10, there are just under 500,000 combinations – and there lies the complexity problem. Northwestern simplified initially by allowing for people to be high or low in each OCEAN trait, and hence there are only two levels in their analysis. Naturally, the fewer levels, the more the data clusters, but people don’t fall into neat categories at the top and bottom of each trait. They sit somewhere along a continuum between two extremes. This new research doesn’t allow for that. At the outset of the paper, the researchers explain that it shows that these 4 clusters are a small subset of “a much more numerous set of spurious solutions”. That’s another approach to reduction – ignore data that represents other lesser clusters. In the abstract at the start of the paper, the authors also highlight the limitations of “unsupervised machine learning methods to the analysis of big data”. It’s their way of telling the reader that this was an exercise in machine learning and not a thesis in psychology. So, our take on this research paper is that shoe-horning people into neat boxes is flawed, nay even dangerous. The paper was an analysis by scientists. There’s a lot more to be done by psychologists before anyone should think that a test can be taken that categorises people into such general descriptions – even if that were possible or useful. Such categorisation doesn’t allow for the nuances that naturally exist. Each person sits somewhere on the scale for each of the Big Five traits. And from many thousands of data sets, there will be many similar profiles, but in the end, everyone is different. The Big Five is a robust tool offering a means of assessing if someone is likely to perform in role. That assumes that the requirements of the role are also known and that managers seek fit with those requirements. Assessments based on the Big Five are hugely useful in predicting who will fit well with job requirements and they should be used routinely. But they must also be supported with evidence from discussion with the candidate or jobholder. No machine should ever be let loose to make decisions without skilled human intervention and no human should ever make decisions on such simplified a basis as the Northwestern researchers propose. This research is interesting because it furthers investigation and understanding. All scientists would agree that progress is important. The Northwest work is another step, illustrating that perhaps machine learning can help enhance that understanding. But the Northwestern research on its own too easily misinterpreted. It was an exercise in machine learning rather than attempt at development of generalisable personality types. It’s a paper for academics. Managers should avoid trying to put people into such small boxes when recruiting or when making decisions day to day. You can develop your own Big Five assessment for a role within your organisation using our free ‘Define the ideal employee tool’ on our website. You’ll also be able to determine the job preferences and general metal ability for your chosen role. The results will help you decide the traits of the person who will likely excel by inviting you to determine trait requirements. Then call us. We’d be delighted to discuss the whole business of predicting on-the-job performance for candidates and staff. Each of the Big Five are traits with a spectrum along which people sit. Each trait is underpinned by factors which, when combined determine where on the spectrum a person sits. Each trait is discussed below. Those at the openness end of the spectrum are innovative, they enjoy trying out new things and they’ll be inquisitive. Those at the other end of the spectrum will be realistic, practical and conservative in their attitude. High scorers are organised, self-disciplined and extremely conscious of group standards and expected behaviours. At the opposite end are those people who have low self-control. They feel free from social constraints and are happy ‘doing their own thing’. Extraverts are happy to be the centre of attention, they like interaction with others. Introverts on the other hand are more comfortable with their own company and they don’t require constant social interaction. One end of the spectrum is agreeableness, demonstrated by empathy to others. Agreeable people are very accommodating and people oriented. At the opposite end is independence. Very self-assured, quick to make decisions and always challenging the status quo. One end of the emotional stability scale is high anxiety. This gives rise to issues coping with day-to-day activities and a concern about the future. Low anxiety manifests as an ability to cope, composure and a calm approach to life. The personality test data analysed was based on freely accessible Big Five assessments. The Northwestern University researchers took the various tests and conducted machine learning algorithms on the data. As a result they have identified 4 clusters, as detailed below. Getting its name from the fact that everyone scored average in all five OCEAN traits, the paper suggests that this cluster is the least robust in their research. People falling in this cluster scored low on neuroticism and high in all other traits. It is considered by the authors to be the cluster that describes the most desirable traits. Low scorers on openness and neuroticism sit in this cluster. This cluster is made up of those with low scores on openness, agreeableness and conscientiousness. Both the reserved and the self-centred clusters are considered by the researchers to be characterised by less desirable traits. Determining Personality Using Mr Men?